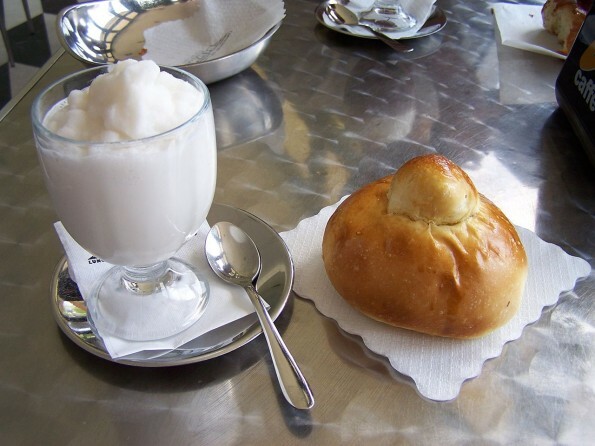 Granita is an Italian frozen dessert, originated in Sicily which resembles to sorbet or Italian ice. It is usually made of sugar water and various flavors which include lemon juice, mandarin oranges, jasmine, almonds, coffee or mint and also strawberries or black mulberries when available. It is quite easy to whip up at home, and if you’re up for it, have it as a refreshing breakfast with choice of bread. Put a saucepan on medium heat with 2 cups water, sugar and a pinch of salt in it; simmer while stirring constantly until sugar is completely dissolved. Remove from heat and stir in remaining 1 cup of water. Let the mixture cool down to room temperature. Then refrigerate covered to chill for an hour. In the mean while put a metal container also in refrigerator to chill. Stir lemon juice, lemon zest and lemon extract into chilled sugar solution, mix well and pour into chilled metallic container. Put the container in freezer compartment for around 45 – 60 minutes or until ice crystals are formed on sides of the container. Bring out for a minute, scrap and fold the ice crystals towards center of the container and return it back into freezer. Repeat the process after every 30 minutes until well crystallized but not frozen into solid. It might take about 3 hours in all. Bring out of refrigerator just before serving and scoop out in serving cup. Serve. Tip: If the Granita has frozen hard, just thaw it in the lower compartment of refrigerator for 10 minutes before serving or churn it in food processor for a couple of seconds before serving.